How can TrueSon Exteriors help choose the right siding for your home? The siding on your home contributes greatly to its overall appearance. If your siding is faded, missing slats or just outdated, give TrueSon Exteriors a call! TrueSon Exteriors knows what you’re looking for when it comes to siding installation in Columbia, Mo. Whether it’s matching your home’s current aesthetic or exploring a new look for your house, our expert siding installers have the know-how to get the job done right. At TrueSon, we provide siding matching not only the style of your home, but also the vision you have for your home. Regardless of the design you’re requesting or the weather conditions, our team will provide you with the expertise you need to ensure you’re getting the best siding for your home. Installing new siding is an investment for you and your family. At Trueson, we pride ourselves on our attention to detail and our ability to solve problems. You can count on our knowledgable staff to give your home a beautiful update with a new siding installation. Trueson Exteriors offers a wide variety of siding styles, colors and textures. No one else in mid-Missouri has a better siding selection than Trueson! The Trueson team only uses the best, most up-to-date technologies when it comes to installing siding on your home. Again, we take your investment seriously and our team is committed to providing excellent siding service. Additionally, our team utilizes the best siding materials and brands. We will work with you to choose the right material for your home and your budget. Below are a few of our current brands, take a look! LP SmartSide – This line of high-performance trim and siding products feature innovative, four component SmartGuard manufacturing process for the strength and resistance when it comes to decay and termites. James Hardie – Covering over 5 million homes in America, this line of siding is designed exclusively to withstand specific climates in which they are used. The perfect siding for the unpredictable mid Missouri weather! Insulated and Basic Vinyl – Choosing this siding method has a number of benefits, including the ability to be installed over existing siding and easily replaceable panels. This the most low-maintenance siding option, and it usually runs to be a little bit less expensive than some of the other siding options. TrueSon Exteriors is more than happy to work with you to choose from the excellent variety of siding materials. We also offer a five-year guarantee on our siding services! Now is the best time to come to TrueSon Exteriors and get your new siding started today. We are running a special promotion on siding, and we don’t want you to miss out! 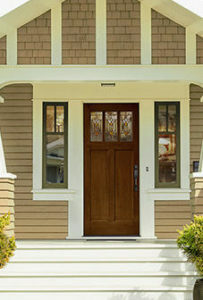 TrueSon Exteriors is proudly offering premium siding with a free estimate. We know everyone has, not only different visions of their homes, but also different budgets for home improvement projects. TrueSon Exteriors will work with you to get the best option for your home without breaking the bank. Call today for more information!